Every now and then Ebay is very good to me. 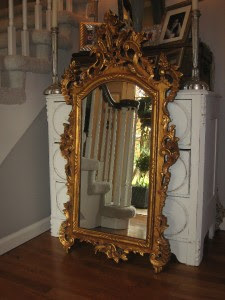 Today I "won" this mirror for $160. Picture this in a very modern bathroom with white walls, floors, tiles everything. I'll have to wait and see how brassy the color is before I actually declare this one of the best days of my life. but even if I have to repaint it, I still think I won here big time! Now all I have to do is learn how to sell stuff on Ebay as my mirror to wall ratio is vastly disproportionate. I LOVE EBAY! OMG!!!! I am so happy for you :) Good bidding, you go girl!